That's one year down, from 1799 to 1798, it happened in Regensburg (100 km distance to Nuremberg) and a Mich. Emmerling, bookbinder in a Wallerstr. offers some games, between them some divination cards and also a game "Spiel der Hoffnung", this, as it seems, in two different editions, one with French cards and another with German cards, a passage, which likely has to be interpreted "with French and German suits". Or both suits at one card, as it is given in British Museum (which somehow confirms, that it is indeed the same deck). 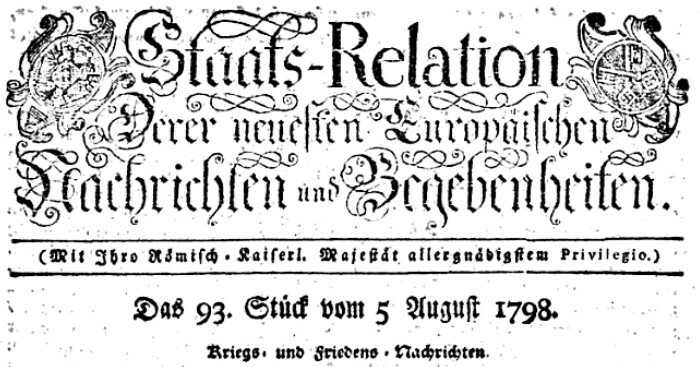 The "Staats-Relation der neuesten europäischen Nachrichten und Begebenheiten" runs (at least ?) since 1746, this edition is just a Mitteilungsblatt, I would assume, 4 pages printed on one piece of paper. With a single business announcement, just that, what you see. The publisher is given as "Neubauer"
Following the common research strategies I get, that Mich. Emmerling is, as expected, "Michael Emmerling", and he was active with the profession "Buchbinder" already in 1785 (though with another address, then: "neben den Herrn Keller"). For this year 1785 we have already from Emmerling a business relation to Bieling in Nürnberg, which means, that he took Bieling products in his shop, likely as Kommissionsware (he got the products and paid, when he sold them). So we still have to assume, that Bieling was the producer of the Spiel der Hoffnung (before August 1798 now). 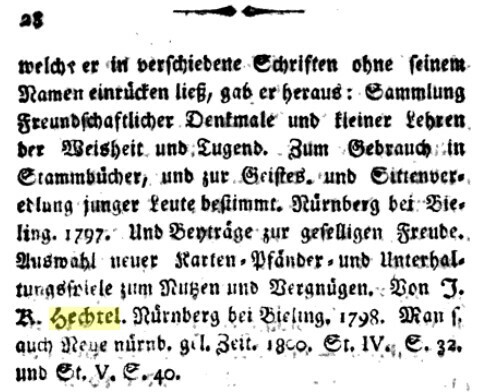 Emmerling announced 1785 in the same Mitteilungsblatt as in 1798. The newspaper appeared three times in a week, and the name of the publisher was "Conrad Neubauer" (earlier I had only "Neubauer"). 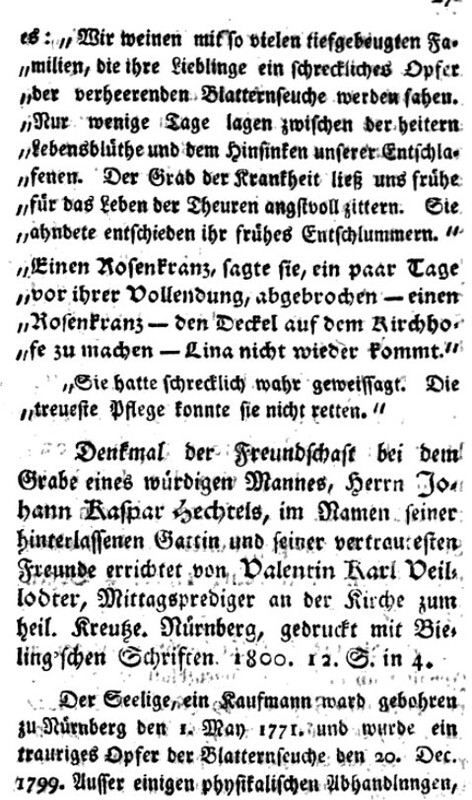 Before the text which reports about Hechtel there's a death announcement of a 3-years-old girl named Lina (a girl in its 3rd year), which notes the many children, who had died cause the plague. In this story it's said, that the child had announced her own death a few days before she died. 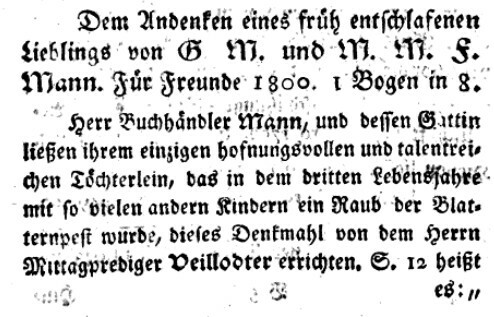 of Veillodter „Ideen über Leben, Tod und Unsterblichkeit (Nürnberg 1809. 3. Aufl., 1818)"
Probably a later title change. The original title means translated "Ideas about life, death and immortality". The book seems to be rather popular. So - somehow - very romantic conditions around the death of the young Hechtel, who just had made a humble running game with cards, but also had very idealistic ideas about education of young persons, as in "Sammlung freundschaftlicher Denkmale und kleine Lehren der Weisheit und Tugend. Zum Gebrauch in Stammbücher und zur Geistes- und Sittenveredlung junger Leute bestimmt." (Hechtel at Bieling 1798). The two preachings of Veillodter at the both funerals (Hechtel and the young girl) must have been rather good. They are noted in a longer lists of his works short after his own death. Possibly Veillodter and Hechtel had a stronger friendship. They had a similar age, Veillodter * 1769, Hechtel * 1771. Verlag:	Nürnberg, bei Gustav Philipp Jakob Bieling. Kurzinfo:	Oktavformat, 150 Seiten, gering fleckig, insgesamt sehr guter, sammelwürdiger Zustand. Es handelt sich um die Erstveröffentlichung des "Spiel der Hoffnung" oder "Spiel der Hofnung", das bisher auf 1799 datiert wurde. Das Exemplar im Britischen Museum ist eine spätere zweite Auflage. Hier liegt die Erstausgabe vor. Die beiden ursprünglich beiliegenden Kupfertafeln fehlen. Das Buch enthält die Anleitungen zu insgesamt 40 überwiegend von Hechtel erfundenen oder bearbeiteten Spielen, darunter "Good Hope oder gute Hoffnung", die Übertragung eines englischen Kartenspiels, "Das Spiel der Hoffnung", "Das Orakel" usw. Desweiteren gibt das Buch Aufschluß darüber, wie Johann Kaspar Hechtel insgesamt über Wahrsage- und Orakelspiele dachte, und welche Eigenschaften die frühesten Karten dieser Art hatten. It is called a first edition from 1798. The book contains 40 games on 150 pages, either invented or adapted by Hechtel. One is is called "Good Hope oder gute Hoffnung" and it is said to be original Englisch (this seems to be not the game "Spiel der Hoffnung"). Another is called "Das Orakel". Further the text promises opinions of Hechtel about Wahrsagespiele. I found a picture of the impressum ... the year 1798 is confirmed with this. The year 1798 had bben already discovered by an announcement (see above viewtopic.php?f=11&p=17538#p14899). The book name had been presented in his life description (as reported above), also added is the year 1798. It means, that the book was presented at the Eastern book fair in Frankfurt and Leipzig 1798. ... returning back to the announcement of Bieling in 1799 (see first article of this thread viewtopic.php?f=11&t=844 ), the text presents 4 items of Hechtel, and the book (offered for 45 kr = 45 Kreuzer) and the game "Spiel der Hoffnung" (offered for 30 kr = 30 Kreuzer) are different objects. The announcement text of the bookseller (who meanwhile wants 2499 Euro) makes the impression, as if the cards would have been part of the book, but one gets doubts, if one compares the relative small difference between the 2 prices. "The object is the first publication of the game "Spiel der Hoffnung" or "Spiel der Hofnung", which had been dated to the year 1799. The exemplar of the British library is from a later 2nd edition. Here we have the first edition. The originally added 2 copperplate engravings are missing. The book gives the rules of about 40 games, mostly by Hechtel invented or re-edited. Between them "Good Hope oder gute Hoffnung", the translation of an English card game, "Das Spiel der Hoffnung, "Das Orakel" etc. Further the book gives information , what Johann Kaspar Hechtel thought about Truthsaying and Oracle games, and what qualities the earliest cards of this kind had." The author of this announcement seems to think, that 2 added copperplate engravings contained the "Spiel der Hoffnung", but they are missing ... and I personally feel insecure, if the text really contained the cards. Perhaps a text in the book makes this plausible, but the text is unknown to me. Beside the Hechtel texts some similar works (also with the theme card divination) of Johann Conrad Gütle appear on the page. Gütle and Hechtel had the same publisher and similar interests in physics and games, possibly the younger Hechtel was a pupil of Gütle, who had also worked as a private teacher. At least the both might have known each other, but this isn't proven.